Since the mid 1990s, various city agencies have discussed and studied the viability and advantages of adding a streetcar/rapid transit system that would serve Downtown, Midtown, North Downtown (CenturyLink Center/TD Ameritrade Park) and even the Henry Doorly Zoo. It appears the time may be ripe for the creation of such a system in Omaha. The original focus of the system was to increase and enhance the city’s tourism industry. Talk centered around a streetcar from CenturyLink Center and TD Ameritrade Park to the zoo. In 2009, the city updated the downtown master plan and received federal funding to re-study transit systems around downtown. This recent study shows Omaha Metro Transit (www.omtro.com) provides good coverage across the city, however, the study also shows a need to shift toward a “frequency-based system” to serve additional midtown and downtown areas more frequently and consistently. While current Metro Transit services provide transportation to and from various parts of the city via bus routes, the rides often involve many stops and transfers. Certain lines are only offered at certain times of the day or on specific days. One system would be a modern streetcar or bus service that would run from the University of Nebraska Medical Center to North Downtown. The streetcar would stop frequently and be used as a circulator connecting locations along its route. 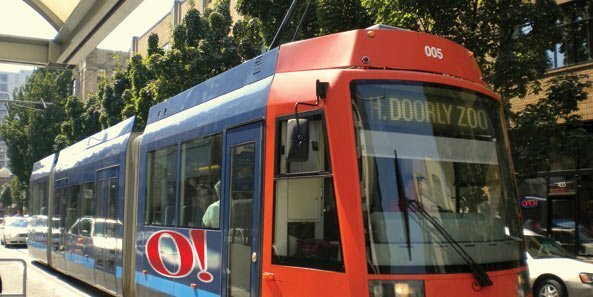 Streetcars allow for more development by reducing the need for parking spots within the corridors they serve and generate additional development, according to Steve Jensen, former City Planning Director, and now serving as a consultant to the City of Omaha. The study also suggests a “Bus Rapid Transit” or BRT system to connect West Omaha to Midtown and Downtown on a frequent basis. These buses would have limited stops and priority traffic movement. Again, reducing the time between these major destinations and running on a more frequent basis would promote ridership. The theory is: If the buses were quicker and more frequent they would become a preferred method of transportation between key destinations. According to Metro Executive Director Curt Simon, the BRT project could possibly happen sooner as the estimated cost is $30 million. This is far less than the estimated $150 million for the streetcar portion of the project. How would this affect real estate development and values? This question is key to the economic viability of these new systems. The study suggests a potential increase in economic and real estate development and values of $1 billion over what is expected without the streetcar/BRT systems. The study further shows the highest impact would be within one mile of the BRT hub sites and within three blocks of the line for the streetcar. The prediction is: If people can count on easily accessible transportation between primary destinations like home, work and entertainment venues, they will leave their cars at home. When riding a streetcar or BRT becomes cheaper and easier than parking and walking to a destination, it will become the preferred option. The result will be a reduced need for parking near work and entertainment areas. In addition, development of apartments and offices along the corridor will demand higher rental rates than other areas, according to the study. The $1 billion in expected new business and residential development will be over and above what would be expected without the development of the streetcar/BRT systems. Phase Two of the study is expected to start soon to determine in more detail the costs associated with developing these systems and how they can be economically justified and paid for without additional taxes. For example, the project may involve federal funding, potential fees or taxes in districts benefiting from the services and other creative financing mechanisms. From our perspective, there seems to be strong community support for an improved mass transit system and a possibility for involvement from private donors.